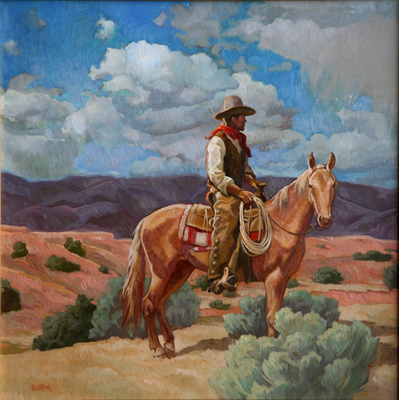 Sue Rother, The Salmon Arroyo, Oil on Canvas, 24" x 24"
Born in Oakland, California, Sue grew up south of San Francisco spending most of her time riding horses, competing in dressage and hunter and jumper competitions. Years of being around horses, gave her an invaluable knowledge of their movement, attitude and personalities. 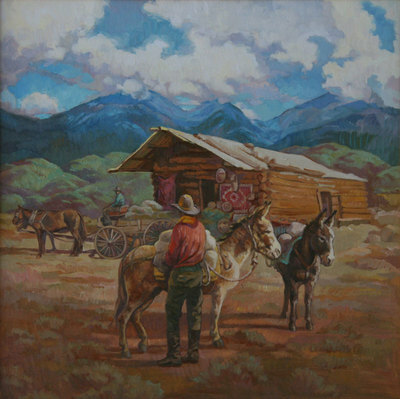 Sue Rother, To A New Camp, Oil on Panel, 12" x 12"
Sue's other lifelong obsession was creating art. She attended U.C. Davis, where she studied under Wayne Thiebaud and others. Further education included Art Center College of Design and The Academy of Art College in San Francisco, where she has been teaching for 11 years. For 25 years Sue painted and drew as an illustrator for clients such as, Disney, Bank of America and Williams Sonoma, Gallo Wines and hundreds of various corporations and publishers nationwide. She has also exhibited at the American Museum of Illustration in New York. Always a painter, the transition from illustrator to gallery artist was a natural progression in Sue's creative endeavors. 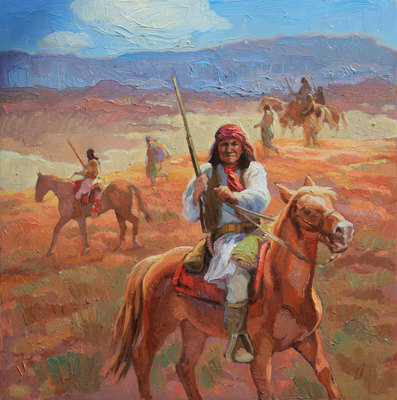 Sue Rother is represented by Mark Sublette Medicine Man Gallery in Tucson, Arizona and Santa Fe, New Mexico. Sue Rother, Casa Diablo, Oil on Panel, 22" x 22"